Sir George Bruce of Carnock lived from 1550 to 6 May 1625. He was a early industrialist who developed a highly innovative system of coal mining at Culross in Fife. The wider picture in Scotland at the time is set out in our Historical Timeline. George Bruce was born at Carnock in Fife. He was the third son of Edward Bruce of Blairhall. After the Reformation of 1560, the lands and properties of Culross Abbey passed to the Colville family. George Bruce's cousin, Alexander Colville, was appointed as commendator of the abbey (a post intended as a lay successor to the abbot, but which in practice was usually indistinguishable from "owner"). 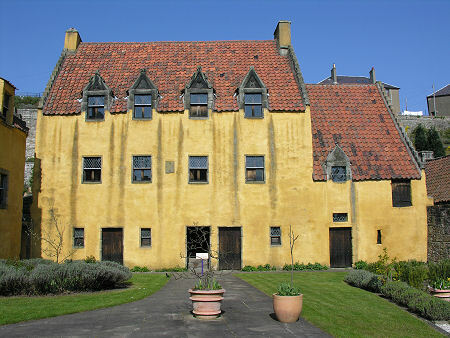 In 1575 he granted the 25 year old George Bruce a lease to restore and operate the colliery at Culross, which by this time had fallen into disuse. George applied the very latest European technology and know-how to undertake developments at what became known as the Moat Pit which were far in advance of anything else found in the UK at the time. The existing Castlehill Shaft stood on the coast a short distance to the west of Culross. The problem was that the coal seam it was exploiting led out under the River Forth. Bruce's solution was revolutionary. He constructed an artificial island in the River Forth to a height of well above the high water mark, and within its confines sank a shaft to the coal seam below. Original accounts suggested this was sunk to a depth of 40ft, though one later account changed this to a less probable 40 fathoms (or 240ft). The new Moat Pit was connected underground with the existing Castlehill Shaft, and between the two, probably on the foreshore, was a third shaft, from which water was drained using water power generated by a dam on the hillside above. The three shafts made ventilation much better than was the norm in mines at the time, and the Moat Pit's location in the river meant that ships could tie up alongside and be loaded with coal directly from the mouth of the pit. The Moat Pit continued to produce coal until the River Forth was struck by a major storm on 30 March 1625. This badly damaged most of the estuary's ports and salt pans, and engulfed the Moat Pit. George Bruce died five weeks later. It proved impossible to drain the complex of the sea water which had filled it, and the Moat Pit and Castlehill Pits were both abandoned. George Bruce was knighted for his achievements in 1610. 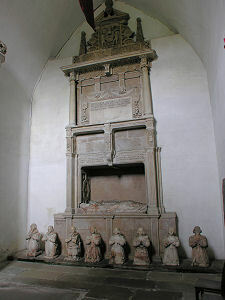 He married Margaret Primrose and, as the remarkable line of praying statues of their children in front of his tomb in Culross Abbey Church shows, they had three sons and five daughters.